Wim Wenders had been making films for over a decade when he was asked by Francis Coppola and Fred Roos, in the wake of the international success of Der Amerikanische Freund/The American Friend (1977), to come to Los Angeles to make an adaptation of Joe Gores’ novel, Hammett. On paper, the collaboration between the Godfather of the ’70s Hollywood New Wave and his German New Wave counterpart appeared to be made in heaven. Alas, as was the case with many of the Zoetrope pictures of the period, including One From the Heart (1982), The Escape Artist and “dream films” like “Elective Affinities” and “On the Road”, agreeing on a workable screenplay turned into a classic studio versus director struggle of wills despite all the good intentions. Production on Hammett started in 1978, but became mired not just in rewrites, but cast changes and halts in filming. During this frustrating period, the ever-resourceful Wenders completed his documentary about Nicholas Ray’s final days, Lightning Over Water (1980), and developed an adaptation of Max Frisch’s I’m Not Stiller. Hammett was eventually released in 1983 to indifferent reviews and an almost non-existent audience (its production history and Coppola/Zoetrope’s confusion about art and commerce at large is memorably detailed and analysed in Jon Lewis’ Whom God Wishes to Destroy: Francis Coppola and The New Hollywood ). As Hammett’s torturous gestation drew to a close, Wenders’ friend, the actress Isabelle Weingarten, told him her latest project, Raúl Ruiz’s The Territory (1981), was having money problems. Visiting the set in Portugal, Wenders helped to get the film completed and also began to formulate an idea about a cast and crew stranded in a foreign country when the backers disappear. The result, The State of Things, one of Wenders’ deceptively simple works, can now be viewed less in terms of the autobiographical context described above, and increasingly as one of Wenders’ great examinations of the difficulties of sustaining friendship and love, the contradictory need for dreams at the expense of stability, the nature of exile and the way nostalgia hinders one’s reading of the past. Without clearing his head with The State of Things, one doubts whether Wenders would have been able to make Paris, Texas (1984) and Wings of Desire/Der Himmel über Berlin (1987) with such precision and focus. 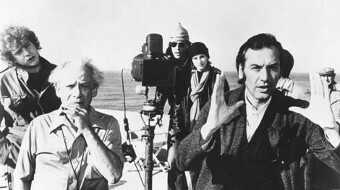 Like Wenders, the protagonist, Friedrich Munro (Patrick Bauchau), is a self-aware director of European art films, who has established a tentative beachhead in Hollywood. The film-within-a-film that opens The State of Things, “The Survivors”, inspired by Allan Dwan’s The Most Dangerous Man Alive (1958), is being shot with independent funds just outside Lisbon. At a crucial point in shooting, the cinematographer (Samuel Fuller) tells Friedrich they have run out of film and the shadowy producers in the US are putting the film on hold until completion funds can be raised. For a few melancholy days the cast and crew, like school children on a “snow day”, make the most of things, in an almost empty hotel by the sea. The tensions between Friedrich and his actress wife (Viva Auder) are kept at bay by the good cheer of their young daughters. The actors drink, eat and flirt with each other. Friedrich’s scenarist (a cameo by co-screenwriter, Robert Kramer, who achieved mythic status in the underground with Ice in the late 1960s) muses on the nature of film and narrative. Fuller’s cinematographer leaves early because of a family illness. This mid-section, with its superficial air of improvisation, is a pitch-perfect encapsulation of people trying to gain both respite and critical distance from the bread and butter decisions that shape lives in the long run. When it becomes apparent that the film is stillborn, Friedrich flies to Los Angeles to meet with a major studio contact (stoically represented by King of the Bs, Roger Corman), and then the actual producer, Tom (Allen Garfield). Hiding out in a Winnebago circling around Sunset Boulevard, Tom tells Friedrich he raised money from the Mafia, who are not very happy their dreams of breaking into the studio big leagues have morphed into an opaque homage. With few options left except mere survival for its own sake, Friedrich moves closer to his final move in the Hollywood endgame. If Wenders’ recent films, with the memorable exception of the transcendent documentary, Buena Vista Social Club (1998), from The End of Violence (1997) to The Palermo Shooting (2008), have increasingly become self-reflexive to the point of absurdity, The State of Things avoids being yet another director’s variation on Fellini’s 8½ (1963) through the wry humour and quiet compassion that underscores the film. Bauchau brilliantly etches a portrait of a director too clever for his own good. His genial tact with family, cast and crew masking a core of narcissism that may be, alas, an essential defence mechanism for straddling the European art film and the studio system. The quirky ensemble Wenders assembled embodies the temporary “family” unit of somewhat self-absorbed, yet sensitive jobbing actors and crew with a naturalism that is both poignant and ironic. For all its allusions to the dying days of the ’70s New Hollywood and the emergence of the “High Concept”, The State of Things could be about any group of individuals suddenly having their routine and structure torn away by outside forces. The deep focus black-and-white cinematography by Henri Alekan heightens the film’s contemplative, but unsentimental portrait of a working life built on both grand illusions and harsh realities. Yes, The State of Things is arguably yet another director’s take on the absurdities of his vocation, but it is also one of Wenders’ most cohesive comments on the battle between individual expression and the desire for a sense of connection. One could argue that Wenders, given the dysfunction of post-WWII life in West Germany, was hoping to find that belonging by coming to America to make Hammett with a kindred spirit like Coppola. That the search proved illusory does not negate the importance of the self-knowledge that Wenders was able to bring to The State of Things and the aforementioned films that followed. There have been many great films by directors about their craft (Stardust Memories [Woody Allen, 1980], Le Mépris/Contempt [Jean-Luc Godard, 1963] and Identification of A Woman [Michalangelo Antonioni, 1982] are my own favourites) and some beyond the pale (An Alan Smithee Film: Burn Hollywood Burn  anybody? ), but The State of Things is that rare “little picture” that truly tells it like it really is. See Jon Lewis, Whom God Wishes to Destroy: Francis Coppola and The New Hollywood, Duke University Press, Durham, NC, 1995. Lee Hill is a writer who lives in London and the author of A Grand Guy: The Art and Life of Terry Southern.